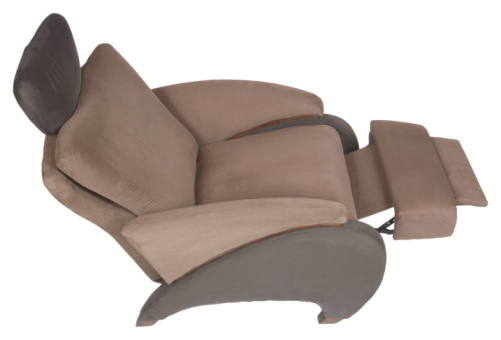 Lazy Boy recliners are a popular furniture choice in many homes. They enable you to lift your legs and stretch out while watching your favorite television program or reading a book. Lazy Boy recliners last for many years when they are taken care of. Many times people opt to reupholster the recliner rather than purchase a new one. When reupholstering, it is necessary to remove the seat from the Lazy Boy recliner. The back is quite simple to remove using two lock brackets on the rear of the unit. The seat, however, bolts into the arms on each side, enabling it to move forward and back when reclining. Place the Lazy Boy recliner in the closed position with the foot rest flat on the front of the recliner. Lift the front of the recliner until the back is resting on the floor. Find the pin connecting the flat pivot bracket from the arm to the bottom of the seat. The bracket swivels the seat as you place the unit in recliner mode. Remove the screw securing the pin to the bottom of the chair with a Phillips-head screwdriver. Pull the pin out of the flat pivot bracket. Repeat for the other side. Position the Lazy Boy recliner back onto the floor in an upright position. Lift the front of the seat above the top of the arm rests. Look towards the rear of the seat and find the two bolts securing the rear bottom of the seat to the back of the arms. Turn the bolts counterclockwise with a socket wrench and remove them from the arms. There are two washers on each side of the seat bracket that the bolt goes through. Do not lose the washers. Lift the seat completely out of the Lazy Boy recliner. Remove the screws securing the seat brackets to the bottom of the seat if necessary for reupholstering the seat.